It's a strange thing when you know someone for a long time and they write a deeply personal book. I mean, I've known Joseph for . . . seventeen years. Sheesh! Has it really been that long? We met at Loyola Marymount, our undergraduate alma mater. He was an English major and I was still a Biology major (I'd later decide to declare a double major). He was always the artist and writer, from what I remember in our classes together. My very first poetry workshop was a 500 level class . . . a grad class . . . and Joseph was there, supportive as ever. He wrote an amazing Icarus poem and I remember how awestruck (and jealous) I was. When he went on to NYU, he was giving me advice when I was applying to MFA programs. He's basically been like my brother for many years. 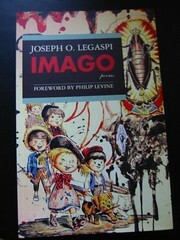 Now I'm realizing how little I knew Joseph--how honest and naked he has rendered himself with the publication of his first book, Imago. The book is seeringly violent, beautiful, and melancholy. I was quite surprised by the tone of it, knowing Joseph as the man who's always laughing, teasing, and smiling. Anyway, pick up this book. You must.